A clash between two distinct types of bassoons has over time resulted in favor of the German bassoon over the French. This would not be a signiﬁcant loss, were it not for the standard woodwind repertoire written by composers with the sound of the French bassoon in mind. This recital is presented in part by bassoonist Daryn Zubke, who plays on a modernized French bassoon that helps keep valuable traditions alive. The Memphis Reed Trio will present selected French works for oboe, clarinet, and bassoon, an instrumental combination popularized in mid-century France called Trio d’anches (Reed Trio). 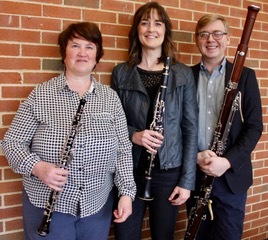 The Memphis Reed Trio includes faculty members from the University of Memphis Rudi E. Scheidt School of Music: Michelle Vigneau, Associate Professor of Oboe; Robyn Jones, Associate Professor of Clarinet; and Daryn Zubke, Assistant Professor of Bassoon. Michelle Vigneau joined the faculty at the University of Memphis in 2003 and had previously held positions in prominent orchestras throughout the United States, Mexico, and South Africa. Robyn Jones also has extensive orchestral experience, playing with the Louisiana Philharmonic Orchestra as Principal Clarinet from 2004-2012 and as a substitute musician with the Minnesota Orchestra, Nashville Symphony and Memphis Symphony Orchestra. Daryn Zubke joined the University of Memphis faculty in 2017. The French bassoon inspires his academic research, and he performs regularly on his custom French bassoon, made by Yannick Duccase of Paris.